To create new records in Salesforce you will only need a spreadsheet with your data. On the Add-ons menu, click G-Connector for Salesforce -> Update/Insert/Upsert Selected Rows. From the drop-downs up top select Insert and Lead, as you will be creating records in the Lead object. G-Connector will try to map your columns for you, but you need to verify if the mappings are correct before proceeding. 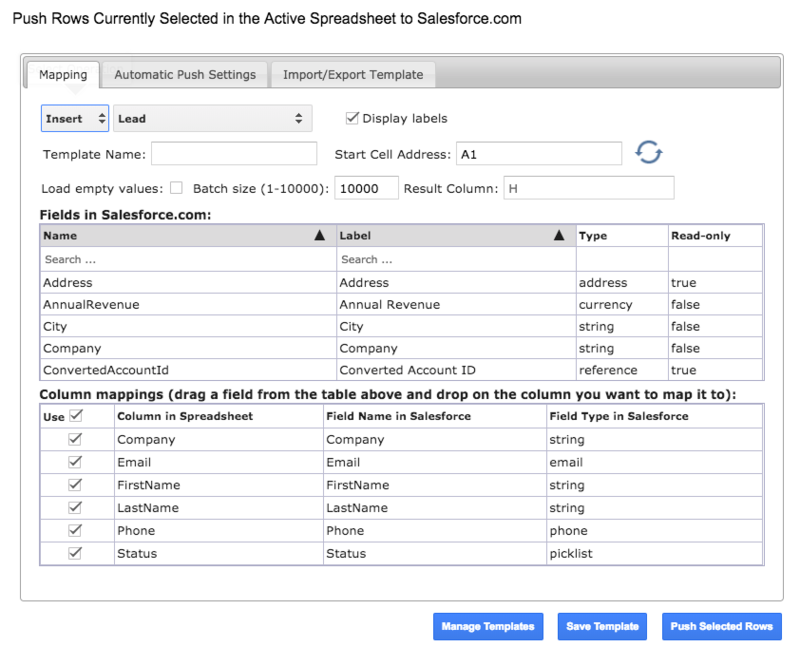 Mappings are shown in the bottom table (see dialog box above) where spreadsheet column names show up in the Column in Spreadsheet column, and fields these spreadsheet columns are mapped to – in the Field Name in Salesforce column. The top table will list all available fields from the selected object. You can map your spreadsheet columns to fields in Salesforce by dragging fields from the top table and dropping them on the column names in the bottom table. Now click Push Selected Rows and your Leads will be loaded into Salesforce.